Hotel and breakfast in Kathmandu. Lodge and all meals while on trek. 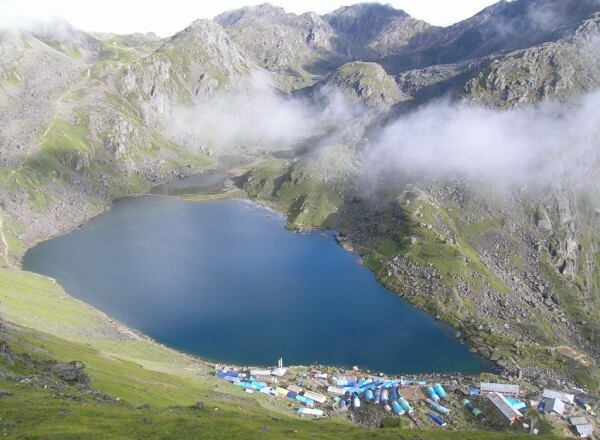 Gosainkunda Lake (4380 m/14370 ft) is one of spectacular trekking destination reached with short trek from Kathmandu. Group of lakes and surrounding peaks make the place surreal. View point above the lake is overlooking at the Langtang valley and the wide range of Himalayan peaks. 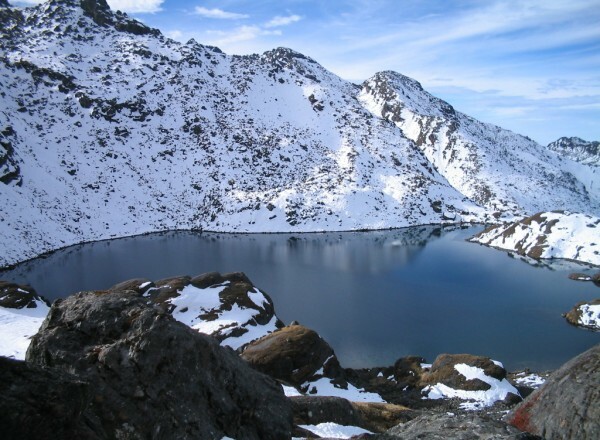 Gosainkunda trek begins right from Shivapuri national park in the northern rim of Kathmandu valley providing the magnificent view of the snow peaks from the first day itself. The walking is through the subtropical forest to alpine zone with Rhododendron, Oak, pine and birch finally climbing above the tree line. 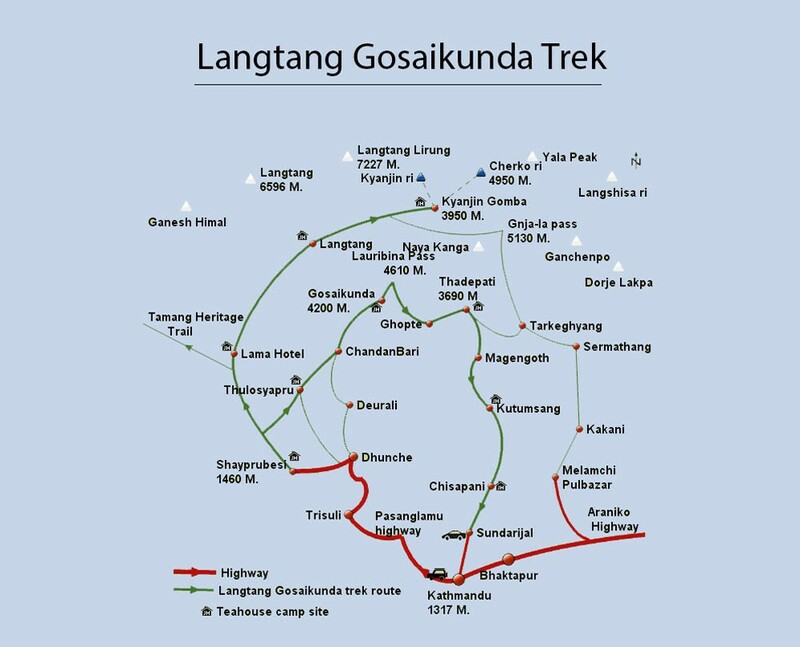 The trek could be combined with Surya peak (5,100 m) trekking / climbing, Langtang valley trek and Ama Yangri peak (3,771 m) climbing in Helambu. Day 01: Upon arrival in Kathmandu Airport and transfer to Hotel. Our representative will picks up from the airport and transfer to the Hotel. Evening we will have dinner with the trip briefing. Drive for about 40 mints to the Shivapuri National park entrance in the north of Kathmandu. Sundarijal is scenic recreation and picnic spot for locals from Kathmadu. Walk 2 hrs. 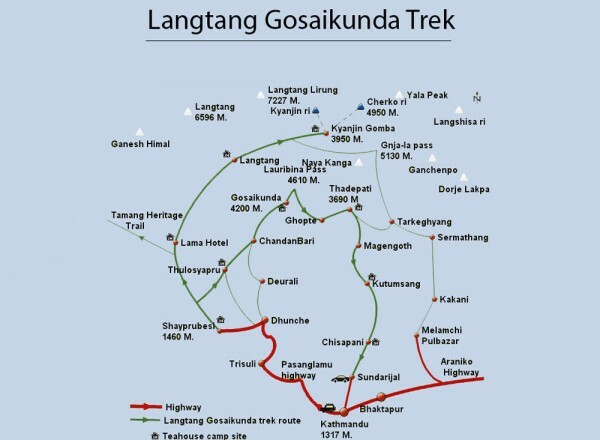 to the Mulpani village where we will have lunch / snacks and then climb through the forest to Chisapani. Chisapani village is perched along the mountain ridge offering view of lush valleys with Himalayan backdrop. The day’s walk is through the lively forest and charming Tamang villages with Himalayan view. Tamang follows pre-Buddhist shamanistic and animistic practices now dominated by Buddhism. 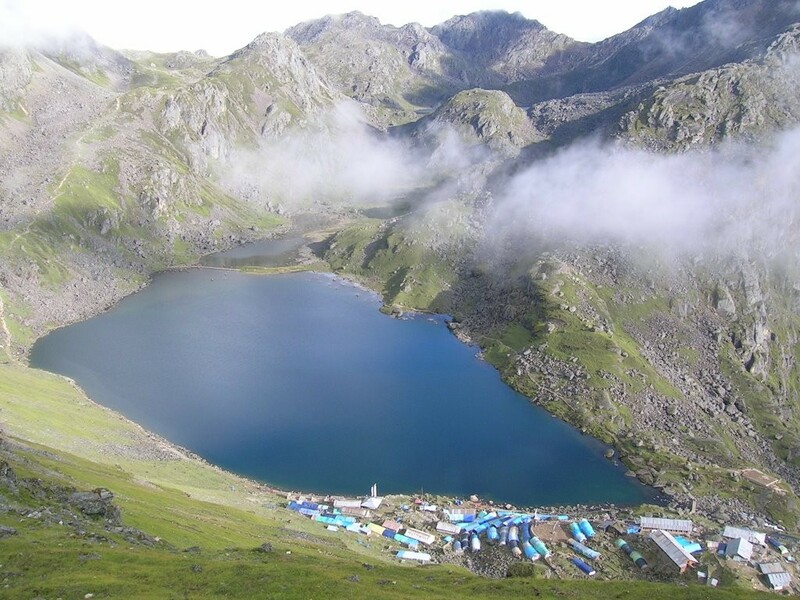 Langtang and Shivapuri national park is popular birding destination that protects several rare species of flora and fauna including the last population of ‘Red Panda’. TThe walking becomes more interesting through sparsely populated, deep forest. Altitude gain slows you down but the temperature and scenery is inspiring. Gosaikunda Lake is sacred for both Hundus and Buddhists. Shamans and other pilgrims visit the Lake during the full moon day in August. It is a complex of about 108 alpine lakes spread in the area of 1,030 ha (4 sq mi). The area is designated as Ramsar Site in 2007. The trail climbs steeply through the rocky terrain and cross the Lauribina pass (4,610 m) coming down to Gosaikunda valley. We will trek down to Dhunche from Gosainkunda. After the breakfast, we will be picks up by our vehicle and drive to Kathmandu.Evening we will have dinner with Nepalese cultural show. Free till departure, One of our representative will picks up from hotel and transfer to airport.